With the Grindmaster-Cecilware B-SGP Precision Brew Coffee Brewer, you can save time by brewing right into a thermal server. 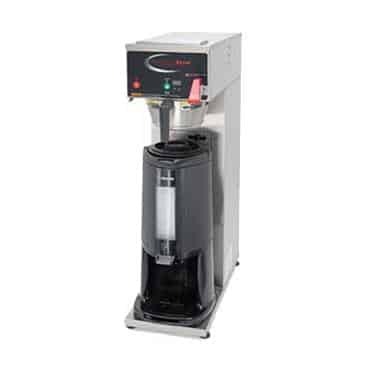 This thermal server brewer is 29 inches tall, 8.25 inches wide, and 17.75 inches deep. Digitally controlled gravity container brewer holds brew temperature to +/- 1°F throughout brew cycle. Brew temperature, brew volume, operator defined pre-infusion/pulse brewing, and low temp/no brew are programmable from the front display. Gourmet Brew basket, (pn 71431) available as an option. Brew Volume - Can be set by ‘teach’ mode to eliminate trial-and-error set-up. Programming Lock-Out - The brewer settings can be “locked” to prevent tampering. Warranty - 2 years parts and labor on the brewer. 3 years part warranty on the control board. Precise Brew Temperature - The brewer will hold the brew temperature to +/- 1°F during the complete brew cycle. Low Temp/No Brew - Allows the brew cycle to begin only when the water has reached the optimum brew temperature. Model B-SGP is a single, digitally controlled brewer. It brews into a 2.5L (85oz.) vacuum insulated gravity container (container sold separately). Vacuum insulated gravity container model GP-2.5 is portable and holds fresh coffee for hours without adding heat (container sold separately). Pulse brewing/pre-infusion - Allows brew sequence to extract up to 20% more dissolved solids per batch of coffee. Programmable: number of pulses, pulse-on time and pulse-off time. Changing the pulse sequence does not affect the brew volume.